Posted: Wednesday, May 27, 2015. 8:47 pm CST. Wednesday, May 27th, 2015. 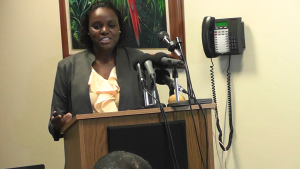 Aaron Humes Reporting: The quarterly press conference organized by the Statistical Institute of Belize (SIB) took place today in Belize City and in the area of overall economic development there was good news to report. On the heels of a 1.6% growth in the last quarter of 2014 and projected overall growth of 3.6% for the year, a growth of 7% was recorded for the first quarter of 2015. Much of that increase was seen in the primary agricultural industries, according to SIB statistician, Angelita Campbell, who reported increases in banana and orange production. Sugar’s late start resulted in a slight slump but marine products rose by 16%, led by shrimp exports. Secondary industries fell by less than a percentage point, increases in production of citrus concentrate, beverages and sugar production offset by falling petroleum, electricity and water revenues and slowdown in construction. The tertiary-service level industries were the other anchor of growth, hotel and restaurant reservations and wholesale and retail trade showing healthy increases. The 7% quarterly growth is the best recorded since 2011 and reverses a negative growth of 1.8% in 2014. The primary trends in trade continue according to the Statistical Institute, with Belize importing more value-added and mechanical products and exporting even less of raw primary products. Statistician Tiffany Vasquez reports that Belize imported more goods to the commercial free zones and in machinery and transport equipment and manufactured goods, but less mineral and fuel oils due to declining prices. On the export side, Vasquez says recovering exports from the big three – sugar, citrus and banana – could not arrest the continuing slide of petroleum. Finally, prices are going down; on average, Belizeans pay 1% less than they did at this time last year and about the same over the last four months. While prices have been trending up recently, figures for fuel prices reached historic lows in the last year. Food declined a tenth of a percent, with lower prices seen in vegetables offset by meat prices. In the municipalities, the South of the country is paying more than anywhere else, mostly for transport and food and alcoholic beverages in Dangriga and rent in Punta Gorda. Transport costs reduced in Belize City leading to a decline in the inflation rate. Belize continues to do well in the region with lower inflation rates than our neighbors.